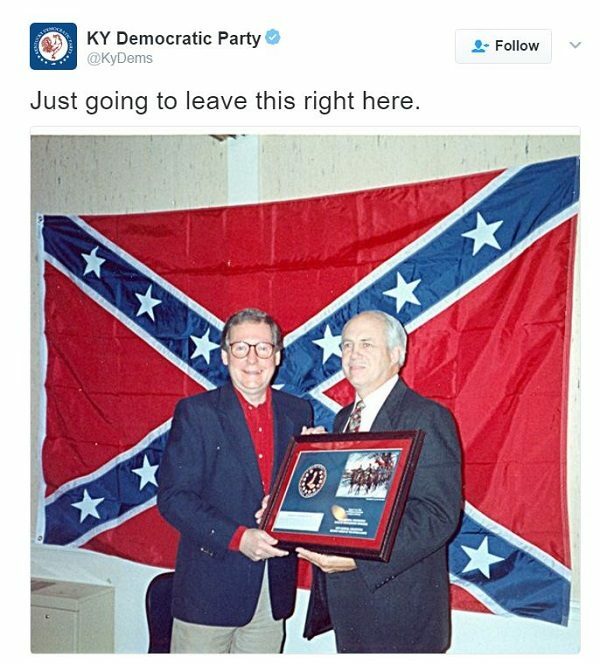 Did Mitch McConnell Pose in Front of a Large Confederate Flag? A controversial photograph of a Republican U.S. Senate leader resurfaced after Democrats posted it to Twitter. When Mr. McConnell concluded, Ms. Warren said she was “surprised that the words of Coretta Scott King are not suitable for debate in the United States Senate.” She asked to continue her remarks. The Confederate Battle Flag means different things to different people, but the fact that it continues to be a painful reminder of racial oppression to many suggests to me at least that it’s time to move beyond it, and that the time for a state to fly it has long since passed. There should be no confusion in anyone’s mind that as a people we’re united in our determination to put that part of our history behind us. Senate Majority Leader Mitch McConnell (R-KY) was among the first to call for the Confederate Army of Northern Virginia’s battle flag to come down in public spaces. He subsequently suggested that it may be time to remove a statue of Jefferson Davis from the Kentucky state capitol, and put it in a museum. The image was taken in the early 1990s at the Big Springs Country Club in Louisville during a meeting of the John Hunt Morgan Camp of the Sons of Confederate Veterans. Within the SCV’s ranks, however, a battle is now raging over whether the group should stick to maintaining gravestones, erecting monuments and studying Civil War history or fight for the right to display Confederate symbols everywhere from schools to statehouses. The bitter conflict has divided the organization’s more than 31,000 members, all of them descendants of Confederate soldiers. Some disaffected members even formed a splinter group — Save the Sons of Confederate Veterans — last fall to defeat what they call the “radical agenda” of the current national leadership. And smack dab in the center of the controversy stands Kirk D. Lyons, a Black Mountain lawyer who gained prominence years ago for defending members of the Ku Klux Klan and other white-supremacist groups. That background attracted national media coverage of the heritage group’s internal strife. Others, however, want the group to keep a more historical focus. Save the Sons of Confederate Veterans co-organizer Walter C. Hilderman III, commander of the SCV’s Sgt. Aaron L. DeArmond Camp No. 1981, in Matthews, N.C., insists that the Sons of Confederate Veterans is the only organization with the resources and credibility to defend the “true story” of the Confederate soldier within the context of his time. We did not receive a response from Senator McConnell’s spokesman in response to our request for background on the photograph.